You probably wipe down your kitchen counters and mop your kitchen floor every day, or at least regularly. Your kitchen cabinets, on the other hand, may not get the same attention—but they should. All day they collect dirt, dust, splatters, grease, and other cooking residues; over time this mixture sticks to cabinet surfaces like a tacky glue that can be difficult to remove. 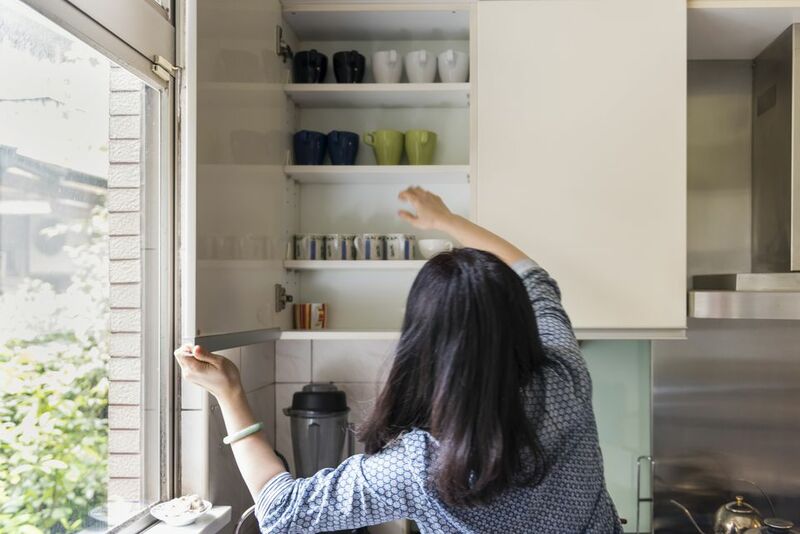 Besides becoming an eyesore, unclean kitchen cabinets could pose a health risk: Bacteria like salmonella can easily contaminate cabinet handles and knobs. Grime and old food particles have no business building up inside the place where we store the items we put our food on. Your kitchen cabinets need simple, regular maintenance. Ideally, you should wipe down the exterior of your cabinets every week, or at least every other week. But every few months, the interior of your cabinets needs a deep-clean. The idea of emptying out your entire kitchen may sound overwhelming, but if you approach the task one cabinet at a time it'll be easier. For example, if all your plates are in the dishwasher at a given moment, you can use that opportunity to clean the spot they usually sit in. Keep a list of what you’ve cleaned as you go, and make sure you cover the spots where your plates, bowls, and drinking glasses sit. Most cabinet types, including metal, plastic laminate, painted wood, and vinyl cabinets, can be cleaned with a solution of liquid dish soap and warm water. This simple and mild solution is enough to get food smudges, dust, and mild grease build-up off of your cabinets. Dish soap works as a degreaser and can even remove some tough buildup on the exterior. An all-purpose cleaner can be used to clean cabinets too, but it's important to test cleaners in a hidden spot to make sure that they won't damage your cabinet's finish. Be sure to read the instructions before using, and test first in a hidden spot. Begin at the top and work your way down each cabinet. For tough cabinets that are empty, you can spray directly onto the surface; otherwise, spray onto a cleaning cloth and then wipe the cabinets down. Don't forget the edges and sides of your cabinets. Rinse thoroughly with another clean cloth, before drying with a final cloth. Water left sitting on your cabinets can discolor and damage them. To clean glass- or mirror-faced cabinets use commercial glass cleaner. Spray the cleaner onto a lint-free cloth or paper towel before wiping. Never spray the glass directly because the cleaner can seep into woodwork or other parts of the cabinet and cause discoloration. Remember to wipe cabinet handles, knobs, and pulls. For metal hardware on wood cabinets, dip a toothbrush in a 50/50 solution of vinegar and warm water and scrub the hardware, the surrounding wood, and the crevices of ornate trim. If possible, remove the hardware from the cabinets and drawers before cleaning. Empty each cabinet, beginning with the highest one. Remove any torn or discolored shelf lining if necessary. If the interior cabinets have a lot of crumbs and residue, it may be a good idea to vacuum the cabinets out after they've been emptied, before wiping them down. Wash the interior of the cabinets with warm water and a mild detergent. Rinse with another clean damp cloth. Wipe dry with an additional cloth to make sure no standing water is left to damage the cabinet surfaces. Wipe down dusty cans and containers with warm water and dish soap on a dampened cloth. Throw out any items that have expired. Dry items thoroughly before replacing them in the cabinets. Leave the cabinets open for 1 to 2 hours to fully dry, before replacing the contents of the cabinet. Sometimes the buildup of grease—an orange or yellowish sticky substance—on your kitchen cabinets is so thick that it can be seen but not easily removed. An orange oil cleaner can help, especially if it is allowed to sit and penetrate the grease for two to four minutes. This may need to be repeated a few times. You can also gently scrub the area with a paste of baking soda and water and a soft bristled brush. Depending on the finish of your cabinets, a magic eraser might be a good option. Since magic erasers can scrub away the finish of surfaces, you'll need to test it in a hidden spot on your cabinets first. Avoid trying to scrape away the grease since this increases the chance that you will damage the cabinets' finish. Dust your cabinets at least once every two weeks with a soft cloth, rag, or standard duster. This should cut down on the need for a deeper cleaning. Clean up spills as soon as they happen with a damp cloth or sponge. The longer a substance hangs around on your cabinets, the greater the likelihood it will cause difficult-to-remove stains or other damage. Cabinets installed near a self-cleaning oven are prone to damage from the intense heat that can escape from a faulty heat gasket seal. To avoid this, remove the doors (if possible) and drawers from all cabinets above or adjacent to the oven during a cleaning cycle. Keep heat-producing appliances—such as coffee makers and toasters—away from cabinets; excess heat and moisture can damage cabinet surfaces.